I regularly collaborate with other artists and designers to create visualizing eye melting projects. 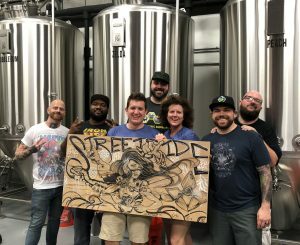 Live Art with Six Bomb Boards: Six Bomb Boards is based out of Lexington, Kentucky and specializes in Live Art (creations of original pieces of art in a short period of time in a public setting) in local bars and at special events. Live art events provide a different atmosphere for artists to to work in beyond solo work in their studios. It also creates an unique energy in a space, as onlookers enjoy the opportunity to see a piece of art formed from beginning to end. 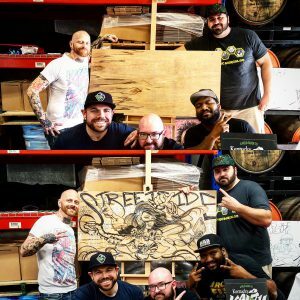 I also partner with artists to paint murals for both commercial sites (restaurants, bars, breweries, independent retail locations, etc.) and residential spaces. You can see the mural for Fibonacci Brewing that Jaimie Filer and I created below.